I'm a big fan of wheeled soft skins, particularly the small passenger cars of the 1930s and 40s. Not many small passenger vehicles kits are available in 1/72 scale, so this release was a welcome one for me. About the kit. 4 Sprues of parts, a small set of decals and an instruction kit comprise the contents in the box. On first sight the casting is fairly typical of ACE, sprue attachments to parts are quite solid. A small amount of flash is on some of the small pieces. One thing stands out straight away with the pieces. Two different bonnets and radiator grilles are supplied. From checking the web it seems there were three different types of the Olympia, two with a more rounded bonnet and grille, and another version with a more squared bonnet and grille. This kit builds the squared version. Note that the vehicle sides don't allow building of the rounded version, the sides are on their own sprue, and evidently another release is planned with differing sides to accommodate the rounded grille and bonnet. Checking the website Kfz. der Wehrmacht, the rounded version parts supplied here are for the Opel Olympia K38 built 1937 to 1940 & 1942 to 1943. 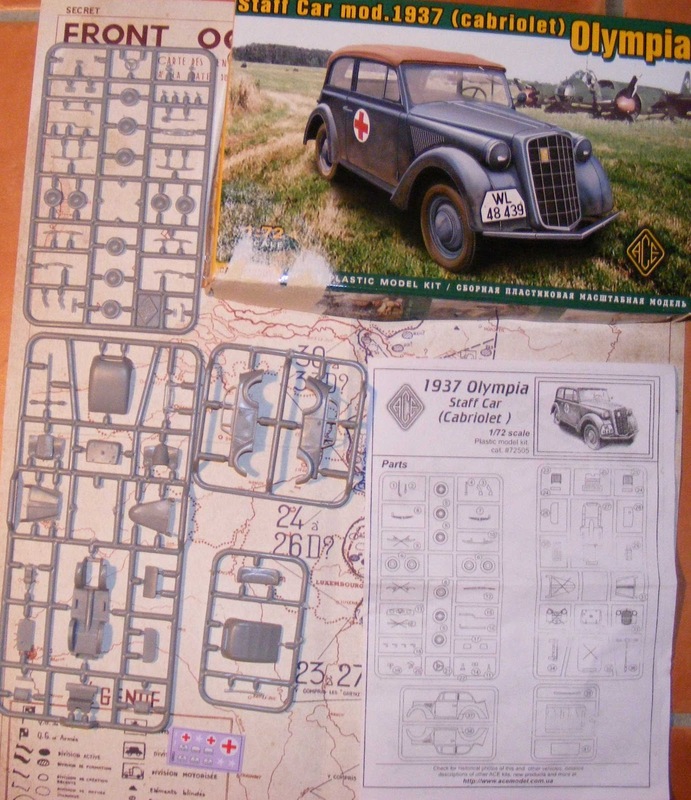 The version in this kit is the Opel Olympia made from 1935 to 1937. Also two differing roof types are supplied - one is a soft top (for this build) the other is a hard top. This kit is the soft top and the kit can be assembled with the soft top roof up or down. And differing types of bumper bars are also on the sprues. Also the sprues include two sets of wheels, one with solid rims, the other with tiny holes around the rim. Again, according to the website Kfz. der Wehrmacht, the solid rims are the 1935 model and the holed rims are the 1937 model. The Build. Typical of ACE instructions, the build commences with the underside of the chassis. This part of the build is quite straightforward & hassle free. Next is the interior. The front seats have a frame, that just needed a light scrape with an exacto blade. The pleating on the rear seat was not sharply cast, but I don't see this as a negative, the pleats can easily be scribed if more definition is desired. The gear stick was not very rounded and had a bit of flash on it. I bent a piece of wire to replace it with and attached a water filter ball with liquid superglue for a gear knob. The outer walls were then assembled, with dashboard/firewall. The steering column was replaced with wire. I almost missed the dashboard, which is included as a separate part. Another cool thing about this kit is that interior detail is cast on the inside of the doors - which includes door handles, window winders and map pockets. These are not badly cast considering this model is so tiny it would fit inside a matchbox. Those building the kit with the "soft top" down could always cut off and replace the handles with bent wire for a really good look. Also the outside of the doors have separate door handles, supplied in the kit, which could also be replaced with wire, for a better look. The affixing of the bonnet and radiator was the most difficult part of the assembly. As the parts are cast quite thick, and with some uneven edges, a scrape with an exacto blade was needed along all edges, then further gentle scraping and sanding to get the bonnet, radiator and sides all places correctly in relation to each other. I possibly removed a little too much from the bonnet, as I then had to fill the area rear of the headlights to get a smooth even shape. The only other major body component to add was the boot, which also required a bit of filler, as period photos show this was moulded into the body, with no visible join. Then Lifecolor acrylic Antharcite Gray was brush painted over the model to identify any areas where joins or filler needed imrpovement (though I still missed a few spots that I will fix)< then a basic paint job was applied, Humbrol enamel Matt 94, sprayed lightly. I decided to go with a mid-late war camouflage scheme. Next bands of Humbrol enamel Matt 113 ( red brown) and 80 (green) were sprayed in irregular bands. The canopy was test fit, it needs a little sanding to get a better fit. As well as working on the canopy, still small details to add, and more work on the paint job needed. Conclusion - despite its diminutive size, this vehicle has quite good detail. A few fit issues, but overall a good kit, and a very welcome addition to my collection, at present at rest on a diorama.